You'll find a wealth of useful, specialized material such assuccessful career case studies and tips on internationalfundraising and on-the-job stress. Relevant bibliographicinformation is featured at the end of each chapter, and listings ofhelpful Internet sites and important statistics are included.Careers in Fundraising offers up-to-date and in-depth advice forstudents interested in an exciting career and professionals lookingfor a new challenge. LILYA WAGNER, EdD, CFRE, has been associated with the Center on Philanthropy at Indiana University since January 1991. She is a frequent workshop and seminar presenter and speaker who works with fundraising curricula, and is a faculty member at The Fund Raising School, which provides fundraising training internationally. She is also a member of the philanthropic studies faculty at Indiana University. She speaks and writes extensively on philanthropy, fundraising, and nonprofit management. Foreword (P. Maehara & T. Seiler). PART ONE: UNDERSTANDING THE NONPROFIT SECTOR AND THE WORKINGENVIRONMENT. Philanthropic Traditions and the Nonprofit Sector (R. Payton& D. Burlingame). Historical Perspectives of the Profession (C. Williams). PART TWO: THE FUNDRAISING PROFESSIONAL'S ROLE. The Value and Importance of Fundraising for a SuccessfulNonprofit Organization (J. Mixer). Skills and Qualities of the Aspiring Professional andFundraising Positions to Match (H. Hall). Value of Fundraising Skills and Experience in Other Careers andPositions (C. Hamilton). 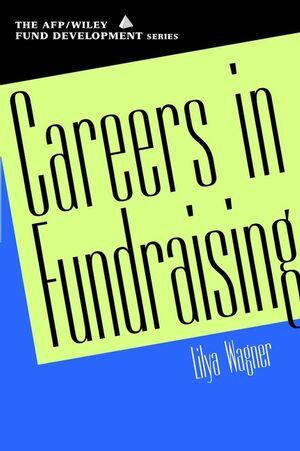 PART THREE: PREPARING FOR A CAREER IN FUNDRAISIING. Preparation Through Academic Programs (J. Levy). Training Programs and Continued Education (D. Tinker). On-the-Job Training and Mentoring (T. Conour). Suggestions for Career Changers (R. Blackmon). Successful Career Case Studies (M. Dennis, jr.). PART FOUR: ISSUES AND ASPECTS OF A FUNDRAISING JOB. Salaries and Wages (J. Greenfield). Promotion and Career Advancement (R. Raker, III). Diversity in the Profession (C. Johnson). Working With a Boss (F. Haddad). Working With a Team (J. Ryan). Working in a One-Person Shop (D. Helmus). Pressures and Stresses of the Profession (T. Grossnickle). PART FIVE: CONDUCTING THE JOB SEARCH. Where the Jobs Are and Finding the Right One (D. Sternberg). Suggestions for a Successful Interview (R. King). How to Avoid the No-Win Job (R. Thompson). How to Exit Gracefully (A. Lane). What to Look for When You Are the Employer (R. Simonds). PART SIX: MAINTAINING EXCELLENCE AND EQUILIBRIUM. Being a Winner in the Fundraising Profession (E. Schumacher andJ. Gillespie). Creating a Personal Mission and Performing with a Passion (M.Baumgardner). Conclusion: The Future of Fundraising: What Lies Ahead (S.Weinstein & J. Chandler).